Little, Brown Books for Young Readers, 9780316452380, 208pp. 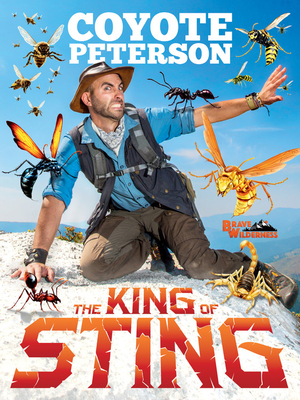 Wildlife expert and Emmy Award-winning Coyote Peterson brings his 12.5 million YouTube subscribers and legions of kid fans a full-color exploration of his "Sting Zone" adventure series, featuring shots from the episodes and culminating in his thrilling encounter with the "King of Sting"--the Executioner Wasp. Coyote Peterson, YouTube star, animal enthusiast, and creator of the Brave Adventure series, has tracked down some of the world's most painfully stinging insects and chronicled getting stung by each of them on his YouTube channel. Coyote has saved the best--or possibly the worst--for last, and he's finally ready to share his experience with the most painful sting in the world: the Executioner Wasp. Featuring full-color stills from his show, and packed with facts about nature's most misunderstood creatures, King of Sting is a dream book for any kid that loves animals, bugs, outdoor exploration, and danger! Emmy Award-winning host of YouTube's "Brave Wilderness", Coyote Peterson spent most of his childhood scouring nearby forests and swamps looking for whatever creatures he could get his hands on. His obsession with outdoor adventure and scaly, dangerous creatures took him to Ohio State University, where he honed his skills in storytelling and met his future business partner, Mark Vins. A few years after graduation, Coyote and Mark formed "Brave Wilderness," the online destination for the next generation of outdoor explorers and animal enthusiasts.